Leadership to all Erebor units. Thorin attains Orcrist. Activate to draw the sword and temporarily gain +75% magic damage. Enemy units around Thorin are slowed and lose -30% armor. Refreshes nearby hero ability timers and heals nearby units. Fili gains +20% attack damage when near Kili. Fili deals heavy damage to a single target, temporarily crippling it. Fili temporarily gains +25% attack and movement speed. +33% attack and armor to nearby troops. Kili gains +20% attack damage when near Fili. Temporarily increases Kili's rate of fire by 50%. Grants experience to nearby troops. Only affects Dwarven troops. Balin grants +15% movement speed to nearby units and heroes. Dramatically increases Balin’s vision range. Targeted structure temporarily gains +250% resources. Balin temporarily empowers a friendly hero, granting them an increase to armor and experience gain. Balin also attains his regal armor, increasing his armor by 50%. Dwalin gains +15% to attack, armor, and attack speed when near Thorin. Dwalin slams the ground, knocking back enemy units and dealing heavy damage to structures. Dwalin lets out a yell, frightening away any enemy units near him. Dwalin gains +300% armor and his attacks deal knockback for a short time. A precise arrow shot that significantly slows down an enemy hero. Targeted units gain experience. Only affects Men of Dale, Laketowners, and Dorwinion units. Bard delivers several barrels of fish, passively healing nearby friendly units. Leadership, also attains his armor. Summons a thrush. Bard gains immense damage versus monsters, most significantly Smaug. Leadership to Iron Hills units. Dain swings his weapon, knocking back enemy units. Dwarves within the radius gain attack power, speed, but lose armor. Rank 8: To The King! Summons two hordes of Iron Hills Warriors. Bilbo puts on his magic ring. Becomes invisible. After some time, the Eye of Sauron will reveal him. Causes enemy units in the radius to fight amongst themselves. Units in a large range around Bilbo gain significant buffs. Allows Roäc to grow in strength. Becomes more expensive the higher Roäc ranks up. At rank 1, he gives +5% movement speed, at rank 3 he additionally gives +10% experience gain, at rank 5 he gives +10% movement speed. Roäc becomes invisible while remaining still. Enemy units are slowed by 25%. Friendly units within the radius gain experience. Summons several barrels of Old Toby that produce resources. Wizard Blast with fire effects. Rank 1: You Shall Not Pass! Nearby foes are knocked back and take damage. 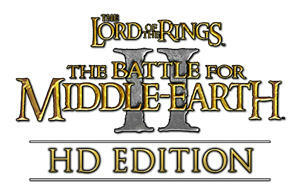 In a later release, Erebor will be able to switch between two different eras: Hobbit Erebor and WotR Erebor. When King Dain's health reaches 25%, he gains +100% armor for a short time and knocks units back. Weapon toggle between Balin's Axe and Gloin's Axe. Rank 3: Nobody Tosses a Dwarf! Gimli leaps into the enemy, knocking them back. Creates a trap at target location. Enemy units that enter it are stunned. Gloin knows of routes younger warriors do not. Teleports targeted units to targeted location. Nearby structures receive +25% armor. Nearby Mangonels gain +10% range. Enemy structure is temporarily disabled. Can be cast from a large distance. Earns resources, connected to tunnel system. Grants +50% armor to nearby Vault Wardens. Basic infantry carrying swords/axes and shields. Slow-moving, high armor. At rank 2, gain Dwarven Tenacity, causing them to deal minor splash damage. Basic anti-cavalry carrying Erebor spears. Slow-moving, high armor. May enter Spear Wall formation. Basic archers carrying short bows. Slow-moving, high armor, limited range. Fast, anti-harrassment unit. Strong versus structures. May receive Khûzdul Runes and Banner Carrier upgrades. At rank 2, gain Intimidation, passively slows enemies by -10%. Dwarven Halberdiers, with their front line carrying massive tower shields. Rank 1: Hold Your Ground! As the unit levels the power improves. Drastically increases armor but disables movement. Also immune to knockback damage while in this formation. Nearby friendly units collect resources upon kills. Pelts the enemy with fireworks. Wyrm Slayers are completely immune to flame damage. Wyrm Slayers throw bottles of Dwarven flash flame. Wyrm Slayers briefly become immune to all damage. Rank 7: Runes of Fire Summons a barrier of flames, damaging enemy units and blocking their path. Basic, fast moving infantry unit carrying spears. Dalish Archers. May use Black Arrow Ability at rank 2. Elite. Mix of various infantry types in one horde: Spearmen in front, swords and axes behind. May use Shield Wall formation. Elite. Crossbowmen. High damage, long reload times. Elite. Iron Hills Crossbowmen temporarily knock back enemy units. A buffed version of the Chariot, can be further upgraded with wheel-blades, banners, and crossbowmen. Highly armored siege ram, can be upgraded with heavy armor. Gives leadership bonus and fear resistance. When activated, stuns nearby enemies. Prerequisite to the Arkenstone. Increases armor of walls and wall upgrades, decreases cost. Provides access to Tunnel network, also provides CP and a small resource tick. 10 – Send In The Goats! - Summons a stampede of goats. 25 – Thrór’s Hoard – Summons a Dwarven hoard. Watch out for what your greed could summon. Edited by Dúnedain76, 01 March 2019 - 08:00 PM. Finally the dwarves get a recruitable 'cavalry' and more various siege weapons. A question: if the mineshafts can't guarantee command point bonus, what will do it? Ah that's a remnant from the outdated plan, it will still give the bonus. I especially like the different roles units will fill, for instance "Men of Dale" and "Iron Hills warriors".That gives more flavor and diversity to this heavily armoured based faction. Khuzdul Runes are our term for Forged Blades. Ered Luin dwarves will be made new, and we'll use the SaF Mangonel. I especially like Bilbo's Ringhero mechanics. Of course the main concept is very similar to Frodo, but I like for instance his riddlemaker ability. And especially that he is able to summon Gandalf like this. What i dislike a bit is Thorin's heavy focus on passive abilities. There's nothing wrong with passive abilities. It just feels a bit strange to make most abilities passive. That way you do not really have to trigger any abilities, what makes his microing a lot less important, as he's just fine, when he is somewhere with your army. Also, I dislike a bit the Twirly-Whirlies (but that's a great name btw). They were in the movie yes. But, that doesn't mean that I like them or see any logic in there existence. But those two complaints are just minor points. All in all this looks like a great plan. For the Erebor wyrm slayers, i'd suggest a passive which makes them resistant to fire. So that they can be the perfect counter for MM's Wyrms and not be completely wiped out in a raging fire unlike most infantry. Edited by saruman_the_wise, 15 April 2017 - 12:00 AM. Will the battering ram be similar to the Dwarf Holds' battering ram? I really like the ideas for this faction, and the presence of The Hobbit movies contents, but the fact that there is this Erebor faction that replaces the dwarves original faction, means that some contents like Gimli, a very important character of Lord of the Rings books and movies, will no longer be in the game? I like that this is starting some discussions! As to Gimli, he'll be part of one of Rohan's powers. Dunedain76 might do a War of the Ring-era Erebor submod to include him further. Saruman has got an idea with the fire-retardant Wyrm Slayers, they should certainly be that from the get go. Updated the faction plan with new fortress upgrades, expansions, and wall expansions. It is from the 'Mithril' soundtrack. Edited by kingsjewel, 08 July 2017 - 02:00 PM.